How about a "pop-up beach." Next summer after spring run-off people could just bring their own chairs, coolers, blankets, yoga mats etc and we could convert the gravel bars into beaches. Could be impromptu or could be organized like a community garage sale. Sometimes the best things are spontaneous rather than planned. 'Recently, a friend suggested to me that Calgary should have an urban beach and with the recent flood reconfiguring both the Bow and Elbow Rivers there are lots of new gravel bars that would make great beaches. Calgary’s inner city has traditionally had two rock beaches that are popular summer playgrounds – Edworthy Park and Sandy Beach. The latter is a misnomer as there is no sand, but perhaps that speaks to the fact that Calgarians are so desperate for a beach anything that resembles a beach will do. Edworthy Park on the west side of the Calgary's city centre is a very popular gravel beach. Sandy beach is at the southern edge of Calgary's city centre and is a very popular summer picnic area. But Paris has perhaps the most famous river beaches. Initiated by Mayor Bertand Delanoe in 2002, the “Paris Plage” program has been a huge success. In 2013, there were three temporary beaches, each open to the public at no charge from 8 am to midnight in the summer months. There is also a popular free summer concert program associated with the beaches. The beaches attract thousand of locals and visitors every day in the summer. An urban or city beach is defined by most as an existing open space that is artificially transformed into a beach with the use of sand, umbrellas and seating elements. It does not included swimming or any natural slopping to the water’s edge. The urban beach often is part of the “urban surprise” as it is inserted into the urban fabric in an unexpected but pleasant way. While urban beaches are often at the waters edge they can be over a parking lot, road or town square. They are most often temporary. In Frankfurt, we experienced what we call the “green beach,” which extended the length of the river through the city centre. The “green beach” was a simple, open lawn adjacent to the river and pedestrian bike path. It is a great place where people of all ages love to sit, have a picnic and people watch. It was a great gathering place for locals and tourists alike. We were also able to watch the barges go by, as well as boaters of all types. There was even a place to grab a beer - in a glass stein nonetheless - and go back to the beach to enjoy the animation. How civilized! One of Paris' popular beaches. Note it is beside the river not on the river's edge. It is more like a huge patio. Frankfurt's green beach with beer vendor is just a narrow lawn area between the road above and the pathway along the water. Does Calgary needs/deserves an urban beach. I understand the plans for St. Patrick’s Island redevelopment call for many exciting amenities to be added to the park but there are no plans for an urban beach. Missed opportunity? Maybe, like Paris we need three beaches – Edworthy, Eau Claire and East Village. However, given the dramatic changes in our rivers I am thinking we should look at Frankfurt’s “green beach” concept which would keep our urban beaches well away from the water’s edge, but with good view lines to the pathways and water. The Crowchild Trail gravel bar has the look of a white sand beach complete with its own lagoon and blue/green water. Lots of fun things can happen on the beach. Just happened to catch this couple either getting married on the Edworthy beach or having their wedding pictures taken. Many cities have books published by local authors that tell the city's history via walking tours. These books have inspired me to take a look at my city, Calgary, in new and different ways. Andrew Duncan – author of Favourite London Walks – writes, “walking really is the only way to get to know a city. It’s cheap, easy, beneficial to both walker and the environment and above all, simple”. Prairie Pathfinders – publishers of Winnipeg Walks write, “learning about and appreciating a place, is best done on foot. If you really want to see Winnipeg – its wonderful urban forest, its stately old residential areas, its impressive architecture, its beautiful park trails – you have to get out and walk around it – witness it firsthand." As a result I have written and just published the first two of four books titled "Calgary LRT Walks." The first two deal with things to see and experience in and around the Northwest Stations and South Stations, with the second two focusing on the Northeast Stations, Downtown and West Stations. The routes in the books wander through older communities past many historic buildings and urban artifacts, as well as pathways beside Calgary’s rivers and creeks (although some of these paths and pedestrian bridges will need to be rebuilt after suffering damage during the flood). Many of Calgary’s wonderful parks are included in the walks and there are suggestions for places to take in great views from various points along the escarpments of the Bow and Elbow Rivers. These books offer you the opportunity get to know more about Calgary. As a “forensic pedestrian" there is so much you can discover in Calgary and walking really is the best way to appreciate all the city has to offer. Evereyday Tourist Note: Below are some of the fun things that you will find as your flaneur you way to places in Calgary most of us don't even know exist. These images are just the tip of the urban iceberg that Peyto has uncovered for everyone to enjoy. The Calgary LRT Walks books are available at Owls Nest, Shelf Life, Pages and the Glenbow Museum Shop. Peyto's The Warden and trivia books (more information on Peyto's books and bio is at the end of this blog) are available at: Second Storey Books (Canmore) and Viewpoint, Whyte Museum and Mooseprints (Banff). Although Calgary is known for its Western heritage, lions have played and continue to play a role as public art in Calgary. 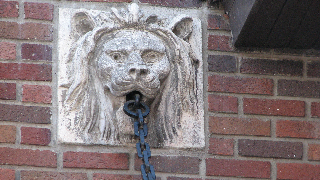 This lion’s head is on the former Holy Angels School on Cliff Street. There are several buffalo sculptures in Calgary. Sunning Buffalo by Eric Peterson is along the path overlooking Twelve Mile Coulee in Tuscany. The Ranchmen’s Club on 13th Avenue SW has several sculptures of monkeys hanging by their tails. Old railway ties remain from when a rail line extended west along the north side of Inglewood to the site that is now Fort Calgary Historic Park. This Macleod Trail stamp in Ramsay dates from the time when Macleod Trail followed the road that became Spiller Road. The street signs in Cliff Bungalow show the former street names. 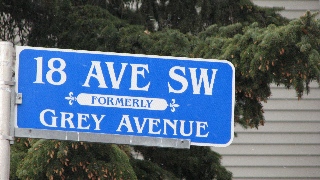 From 18th Avenue south to 25th Avenue the names of Canada’s Governor Generals after Confederation were used. However the name of the second Governor General John Young, 1st Marquess of Lisgar was not used. Why? Wandering along the trails in Shagnessey Heights Park on the south side of Toronto Crescent you pass this very basic bench. 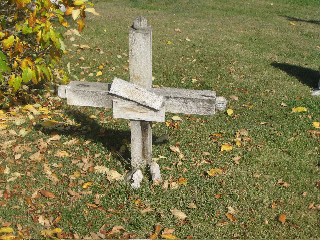 This small wooden cross marks a gravesite in St. Mary’s Cemetery. Pieces of a fence along the north side of 9th Avenue in Sunnyside date back to the late 1940s-early 1950s when mudslides on the escarpment slope forced the residents to move. Old sidewalks in Baker Park are all that remains from when Baker Sanatorium was located on this site. Paperback, 198 pages, 6 x 9 in. The thirty-six walks in the book range in length from 2.1 km to 10.8 km. Walks for the Tuscany Station (scheduled to open in 2014) are included in the book. Paperback, 224 pages, 6 x 9 in. The thirty-nine walks in the book range in length from 2.1 km to 12.3 km. What information is in the LRT Walks books? Walk Overview: description of the area the walk is located. Routes may be a loop, out-and-back, linear or a combination of these options. Route Description & Accessibility: information on how accessible the route is for users of wheelchairs or baby strollers. The routes vary from flat or gently rolling, small hills or steep ascents or descents. On some routes an alternate route with better accessibility is included in the text. Food and Drink: Information on parks, green spaces and viewpoints along the route. Information on coffee shops, grocery stores, convenience stores and restaurants along the route is also included. Washrooms: Location of washrooms in parks and public buildings. Map References: Map page numbers for four different map books – Clearview, MapArt, Rand McNally & Sherlock. Walk – route starts and ends at the station. No bus ride is required. Bus/Walk – ride a bus to the start of the route and walk back to the station. station from the end of the route. Route Summary: Summarizes the directions for the route. Peyto (pronounced Pea-toe) was born in Banff and raised in Calgary. His great uncle was Bill Peyto, for whom Peyto Lake on the Icefields Parkway is named. Peyto taught elementary physical education at three Calgary schools – Connaught, Ogden and Col. J. Fred Scott. As a teacher he organized walking programs for the students. At Ogden School, one group of students visited Fish Creek Park for a three-day walk after school and walked from the east end of the park (Mallard Point) to the west end (Shannon Terrace). Another group did a five-day walk after school. They walked around the Glenmore Reservoir, followed the Elbow River to Fort Calgary and continued west along the Bow River to Bowness Park. After retiring in 2000, he began a self-publishing business – Peyto Lake Books. To date he has published twelve books plus a history book for his church. Banff Town Warden series – four books of his grandfather’s park warden journals from 1914 to 1941 (published in 2002, 2004, 2008 and 2009). He was the warden whose patrol included Banff and the area close to town. Bill Peyto Guide to Canadian Rockies Trivia – two books of trivia about the Canadian Rockies. (published in 2003). Multiple choice questions on a variety of topics – animals, birds, flowers, placenames, history, rivers etc. Walk Calgary’s Escarpments and Bluffs – a 177 km route of 16 connected walks that follow the escarpments and bluffs of Calgary on the Bow & Elbow Rivers and Fish Creek & Nose Creek (published in 2005). This book will be revised and updated after the LRT Walks books are published. Discover Calgary’s Parks and Green Spaces – three book series – North, Southeast and Southwest, published in 2006, 2007 and 2008. Calgary: The Pioneer Spirit Lives on! “I am uncharacteristically speechless. Just had a quiet walk in Rideau. Stories that reduced me to tears but mostly filled me with joy.” These are the words from a tweet of Calgary Mayor Naheed Nenshi as he visited the upscale community of Rideau shortly after the floodwaters began to recede. Like all Calgarians, he was shocked at the destruction caused by our beloved and usually benign Bow and Elbow Rivers. At the same time, he was overjoyed by the amazing community spirit that erupted as soon as there was a call for volunteers to help with the cleanup. As the water receded, the community’s pent up demand to help burst forth. Mayor Nenshi became a hero during the floods, much like Rudy Giuliani the NYC mayor did during the World Trade Centre disaster. He was our superman, as were many of the Alderman who worked tirelessly help their constituents find help. Calgary is very fortunate to have a very dedicated and caring City Council. While some might find this a strange phenomenon in our 21st century world of urban alienation where NIMBYism (Not In My BackYard) and BANANA (Build Absolutely Nothing Anywhere Near Anything) are often cited manifestations of our urban self-centerness. However, a strong underlying sense of community is alive and well in “cowtown” and I expect in many other cities too. When in need, neighbours come together to help each other be it the Goderich Tornado (2011), Slave Lake Fire (2011) or the Halifax Hurricane (2003) or now the Calgary Flood. When there is no need, we mind our own business and get on with our lives, which often doesn’t include the neighbours. While not always evident in the day-to-day comings and goings of suburbanites with their attached garages and six-foot fences or those in the cookie-cutter downtown high-rise condos, Calgarians still do, at their core, have a strong sense of community. It doesn’t hurt either that Calgarians live in small communities (most less than 10,000 people), each with its own name and identity. In many ways, Calgary is not a city as much it is a collective of small towns. Everyone pitched in to help with the clean up - young and old. A couple of women in their 80s drove up to one of these many help centres and said we are too old to help with the clean up so we baked muffins. Everyone did their part. Yes it is part our pioneer cultural base that everyone was expected to work hard and look after themselves. However, if someone is truly in need, the community does come together and look after them. Calgary’s almost impromptu “flood-raising” efforts are a reminder of our prairie past when “barn raising” events were very common with neighbours getting together to help a family build or rebuild a barn. Calgary’s caring culture is not totally restricted to emergencies, every year the citizens and corporations of Calgary donate significantly more per capita to United Way than any other city in Canada, maybe in North America. Simply put, Calgarians care about their neighbour’s welfare; it just manifests itself differently at different times. It was a dirty job but someone had to do it. Like the pioneers a hundred years ago, Calgarians grabbed their boots and got the job done. It was a massive job, but there was a stampede of volunteers. Calgary’s annual “reminder” of our sense of community is the Calgary Stampede. It is a time when young and old, rich and poor come together to celebrate - neighbourhood pancake breakfasts, square dancing in the streets of downtown or watching the rodeo or chucks together. It is more than just another signature festival, or a “pretty face” to attract tourists it is a reminder that the heart and soul of this city is its sense of community. It is fitting that the first flood recovery decision made was that the Stampede 2013 must go on. On June 24, just three days after the flood, Stampede President Bob Thompson announced "We have pumped millions of gallons of water from our facilities, scraped the mud from our tarmac, commenced the cleanup of our Park, all to welcome guests from around the world. Last year the theme of our centennial was 'We are greatest together.' A year later this motto could not be more true! We are greatest together. We will be hosting the greatest outdoor show on earth, come hell or high water. Throughout our entire history we have never cancelled a show, despite two wars and a Great Depression – 2013 will be no exception." That was all Calgarians needed to hear. The “come Hell or high water” became the rallying call for the entire city to cleanup our mess - not just the Stampede grounds, but all the flooded communities - and get on with our lives. This is no small task given the flood happened exactly two weeks just 14 days before the Stampede Parade kick off. The Stampede Grounds and the surrounding communities were the most heavily damaged by the floods and at the time were still under water. However, once the community’s “can do attitude” was ignited, a second flood occurred, a flood of tens of thousands of volunteers came forth to help with the cleanup. Calgary’s “pioneer spirit” lives on even as the city become more and more cosmopolitan. Over 50,000 of these t-shirts were sold in the first week. A politically correct version for kids was also printed i.e. come heck or highwater. Throughout the "state of emergency" Calgarians kept their sense of humour. Perhaps it is a bit early to be calling the flood of 2013 the flood of the century, but it sure looks that way. I have lived in Calgary for over 30 years and have never seen anything like this. As Mayor Nenshi pointed out the flood is "bad and good" for Calgary. BAD in the destruction and costs that it will take to restore the city's infrastructure back to its pre-flood state, but "GOOD" in how the community has come together to help out family friends and strangers. There was no looting, no hysteria, not deaths (in the City of Calgary) everyone was calm and rational. Perhaps it was our pragmatic pioneer independent spirit showing through. Without exception Calgarians have bonded over this emergency enhancing an already strong the sense of community. While over 100,000 Calgarians were evacuated the need for alternative accommodations was met mostly by "family and friends," only a handful of schools and public buildings were needed. As soon as a "state of emergency" was called local social media was swamped with people offering their home not only to family and friends. but to strangers. I saw one tweet that said "I don't have an extra bed, but I have a comfy couch if anyone needs it," others were offering food, meals and donations. Twitter was full of tweets expressing citizens' praise and respect for our emergency workers and city staff. It was also impressive how the Mayor, Premier and Prime Minister were on site quickly sharing information with Calgarians about what was happening and what was going to be done. Nenshi, Redford and Harper all showed tremendous leadership in the face of a pending crisis, as did all the Alderman, MLA's, Police and Fire Chief. I believe this leadership was instrumental in keeping Calgarians calm and allowing for an orderly evacuation of 75,000 people in a matter of a few hours. On Saturday, while the city didn't return to normal, people were starting to go about there normal weekend activities. The City Centre was full of people walking and cycling along or near the river trying to grasp an understanding of what had happened. Already Calgarians were ready to move on. Stampede was planning on how in two weeks they were going to produce a parade for over 100,000 people and host over 1 million people for the "Greatest Outdoor Show on Earth" on a flooded Stampede Park - nobody doubts it will happen. It was surreal to know that billions of dollars of damage happened in just one day. It was a lesson in humility taught by mother nature. The following pictures have been appropriated from various tweets, images sent by friends in emails and my own. The Bow River has been flooding for centuries maybe millennium. Read more about the history of the Bow River floods. "...we are also a wired city. With high levels of penetration in mobile devices and social media – the city has 760,000 people on Facebook (over 70 per cent of the population) – we begin to see how connectivity fuels the city’s spirit. When the relatively short evacuation notice arrived on Thursday, our connected population used online channels to get the word out...read more Brian Singh, Globe & Mail, June 23rd. At one point the water flow in the Bow River was on par with that of Niagara Falls. The Atlantic Cities produced a good summary of the Calgary Flood 2013's facts and figures. Read more. Aerial image of Prince's Island, Calgary's summer playground totally flooded. In many ways this is the heart of the city. Access to one of the pedestrian/bike bridges over the Bow River from the northside to downtown flooded. Normally thousands of Calgarians use these stairs and ramps. Panoramic view of Stampede Park totally flooded. Normally the Elbow River is just a quiet river at the based of the bluff maybe 15 meters wide at most. New 4th Street SE underpass flooded. Water must be 10 meters deep. Luckily it was designed to flood. Kudos to all of the engineers who have worked on Calgary's downtown infrastructure as they have handled the flood with little or no damage. Sandy Beach pedestrian bridge is probably one of the few pieces of infrastructure to be damaged. The Elbow River at this point is usually only a few feet deep. A popular place for people and dogs to play in the river. Prime Minister Stephen Harper surveying the damage. Our politicians were amazing in their leadership as they were calm and articulate in the face of disaster. Our emergency officers and city staff were tireless in their efforts. The emergency response plan was outstanding. Alderman Gael MacLeod with volunteers sorting out clothes for those who were evacuated which included homeless shelters and affordable housing for seniors. As soon as a state of emergency was called Calgarians were asking how can they help. Calgary has a longstanding culture of caring and volunteering. Macleod Trail is one of the major downtown streets with City Hall, Municipal Building, Central Library, EPCOR Performing Arts Centre and Olympic Plaza all fronting onto the Trail. At the end of the day Friday an amazing double rainbow appeared, as if mother nature was saying better times are ahead. On Saturday (next day) people flocked to the flooded areas to see for them the damage. Along the Crescent Heights bluff that has a commanding view of the downtown and Bow River valley hundreds of people lined the promenade for an expansive view of the flooding of Prince's Island and the northern edge of downtown. On the ground the military were already moving in to determine how best to clean up the mess. Eerie image of the lower deck of the Centre Street Bridge that was right at the height of the Bow River as it crested. You can see some of the mud but otherwise no damage. While I was there a larger log floating down the river crashed into this bridge with a loud crack like a bomb going off and yet the bridge acted like it didn't even care. I tip my hat to the engineers who designed these structures. This is what Prince's Island lagoon looks like today. The next photo shows what it looked like before and what it will hopefully look like after. Nature has a strange way of teaching humans to be humble. Inside Calgary's state of the art Emergency Operations Centre hundreds of professionals from various disciplines are implementing a coordinated emergency response. Some are working 20+ hour shifts. Rendering of Calgary's Emergency Operations Centre.